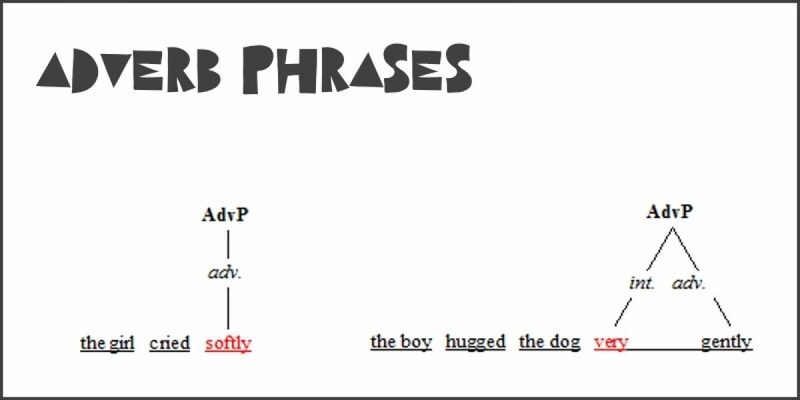 The head word of an adverb phrase (AdvP) is always an adverb, e.g. As with noun phrases and adjective phrases, the head word (usually just referred to as the ‘head’) of an adverb phrase can also be pre-modified by the use of an intensifying adverb. We know that intensifying adverbs are capable of not only modifying adjectives but that they can also modify other gradable adverbs. For example, quietly is a gradable adverb that can be modified by a preceding intensifying adverb, e.g. very quietly, rather quietly, extremely quietly. The adverb softly is another example of a gradable adverb that can be modified by intensifying adverbs to produce utterances such as very softly, fairly softly, quite softly, and so on. Recall that intensifying adverbs always precede their associated adverb and, again, the reason for this should now be apparent, i.e. it is because they also function as pre-modifiers in adverb phrases. Here is an example of the use of the intensifying adverb very to pre-modify the head adverb gently. The following example is similar and demonstrates the use of the intensifying adverb rather to pre-modify the head adverb tightly.